Ditch the old toothpaste and try something new. Did you know many toothpastes you buy at the store are full of chemicals that are not healthy for you? Some brands have tiny little plastic beads in them, now I am not a dentist or Doctor but that doesn't sound safe to me. Two years ago a friend of mine introduced me to making my own toothpaste. Before that I was already using a somewhat safer alternative that is more natural that can be found at a health food store. It can get exspensive and I liked the idea of making my own. I don't have the exact measurements of the ingredients but it was basically coconut oil,baking soda and pink Hymalian salt. 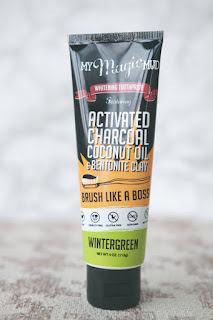 Every few months I would use the powder from charcoal capsules and mix it with coconut oil to give myself a little burst in whitening my teeth. It was working great for me but I was getting bored and wanted to try something new. 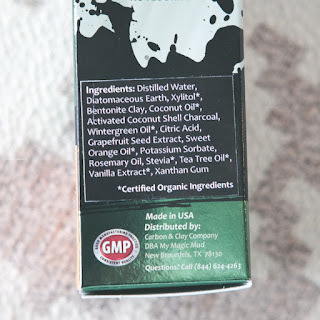 I was looking for another alternative and got a recommendation from a friend for a brand called My Magic Mud. I went to their website and watched their promo video, it is hilarious. After reading more about this company and the products they offer I decided to give them a try. I have not yet found this product in the store so I ordered it through their website. It didn't take long at all before My Magic Mud arrived in my mailbox. 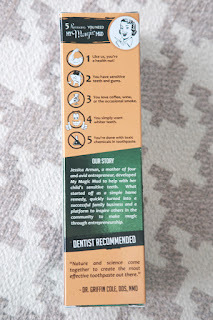 I purchased the toothpaste in a tube in the wintergreen flavor (they also sell a powder form too). 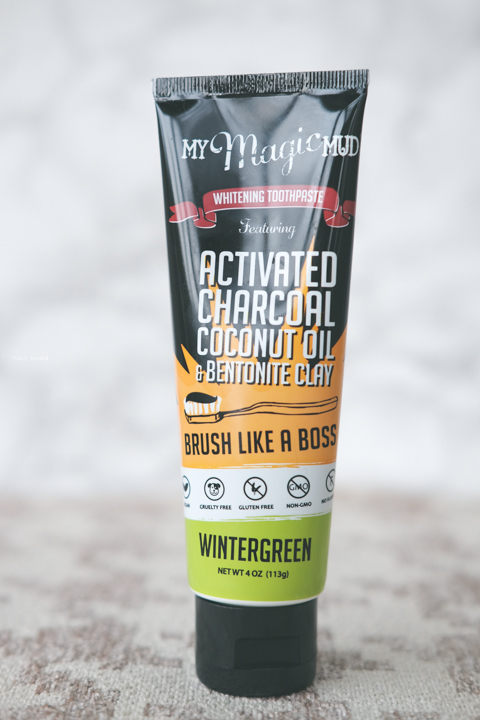 My Magic Mud is an activated charcoal, coconut oil & bentonite clay toothpaste. The company claims it cleans, polishes,whitens & detoxes your teeth. It has ingredients you can pronounce. And it has no foaming agents, no gmo's, no glycerin, non toxic ingredients, no fluoride, no triclosan, no cruelty and most important NO GLUTEN! The directions on the box are simple and easy to understand. I really like all the facts and design of the packaging. 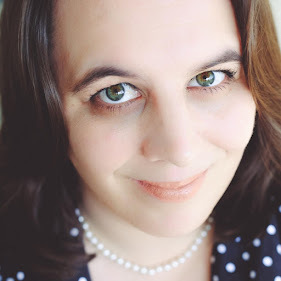 I've been using this product for a couple weeks and I am impressed. It is certainly going to replace my homemade toothpaste. I feel like my teeth are looking much whiter and healthier. 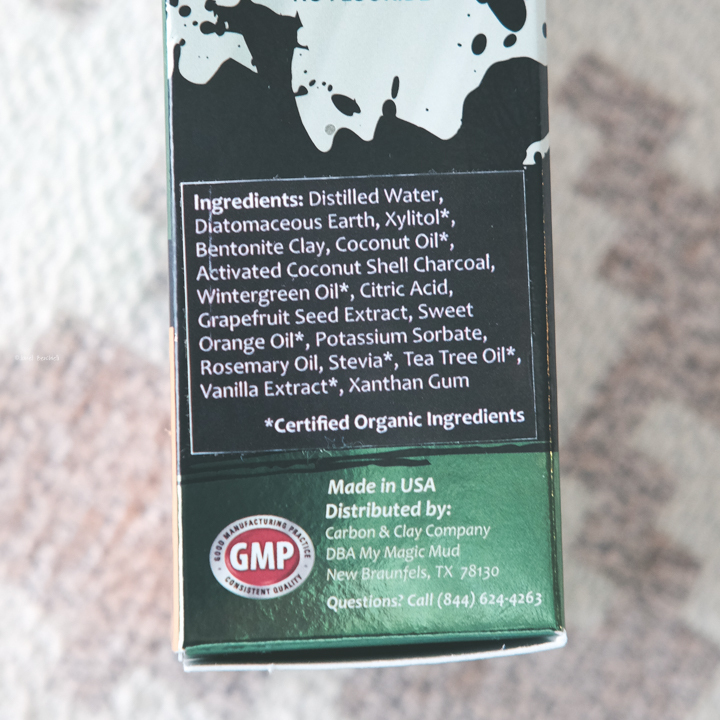 I typically have very sensitive teeth and I have noticed my teeth are not as sensitive since I started using My Magic Mud. When you first start to use My Magic Mud don't be alarmed if you kinda look like a zombie. It is black toothpaste and when you apply your teeth turn black, but don't worry it is temporary. when I say temporary that when you rinse with water your teeth and mouth are no longer black! It rinses the black color right out of your toothbrush and your sink too. I haven't gotten any on my clothes so I don't know if it stains or not but I would just be cautious. I got the wintergreen flavor and I like it. It is not overwhelming at all. I actually look forward to trying their two other flavors as well which are Peppermint and Cinnamon. 1. Like us, you're a health nut! 2. You have sensitive teeth and gums. 3. You love coffee, wine or the occasional smoke. 4. You simply want whiter teeth. 5. You're done with toxic chemicals in toothpaste. I really like this product and highly recommend giving it a try!